Despite the progress in the disciplines of infectious medicine and pharmacology, S. aureus continues to be a major human pathogen. Infections caused by this micro-organism range from superficial lesions, such as wound infections and abscesses, to life-threatening syndromes, including bacteremia, endocarditis, meningitis and osteomyelitis. The increasing prevalence of antibiotic-resistant strains, especially methicillin resistant S. aureus (MRSA) and the emergence of vancomycin resistant S. aureus (VRSA), has rendered staphylococcal infections a serious public health concern. Figure 1. A schematic representation of the Staphylococcus aureus quorum sensing system. is a transmembrane transport protein with endopeptidase activity and facilitates AgrD cleavage, followed by secretion of the resulting octapeptide,6 subsequently termed the auto-inducing peptide (AIP). AgrC forms a membrane-bound histidine kinase, which senses external levels of AIP. 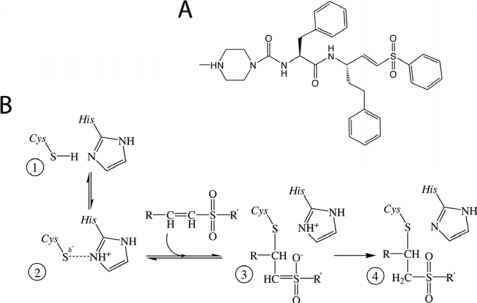 This binding event results in auto-phosphorylation of AgrC, followed by transfer of this phosphate to the intracellular AgrA protein. 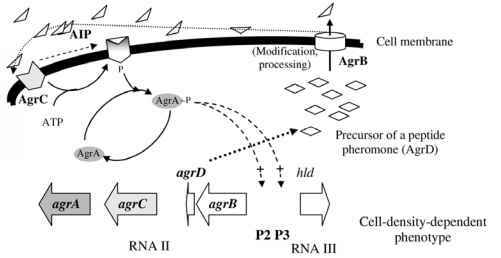 AgrA is a DNA-binding protein which leads to activation of the P2 and P3 promoters, as well as direct activation of specific toxin genes7,8 (Fig. 1). This process is required to diversify the composition of cell surface proteins and to transform the bacterial phenotype from one of adhesion, expressing a variety of surface proteins responsible for binding to host tissues, into one of invasion, producing factors which degrade tissues and allow for the spread of infection from initial colonisation foci.9-11 An additional regulatory system, mediated by the DNA-binding protein SarA (staphylococcal accessory regulator) acts in a somewhat opposing manner.12-14 While the agr system promotes transformation of S. aureus cells into a migratory phenotype, SarA promotes the adhesive properties of the bacterial cell. 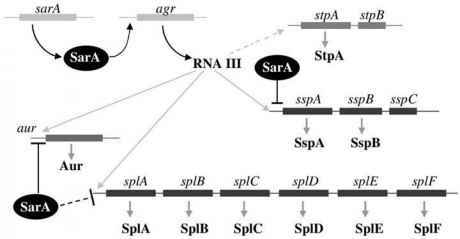 Additionally, sarA regulates virulence factor synthesis, both directly or indirectly, by modulating the transcription of other virulence determinant regulators.15 Furthermore, analysis of the phenotype of sarA mutants reveals intensive overexpression of extracellular proteases,16 demonstrating the restricting effect of SarA on protease production. Along with these intracellular regulating factors, this pathway of phenotypic switching, which is a hallmark of S. aureus infection, requires proteolytic enzymes to cleave the surface proteins, which decorate the exterior of the cell.